The Chevron Baby Blanket by Purl Soho. 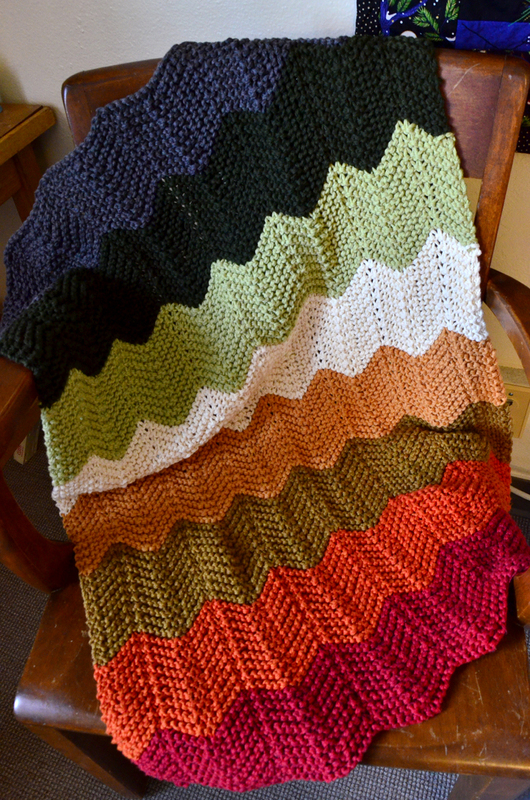 I have completed the knitting on my Chevron Baby Blanket. I’m totally smitten with this afghan and I wish it were my size. It could make a great lap blanket, but I think I’d like to save it for a baby. I say I’m finished with the knitting because I’d like to line the wrong side of the afghan with some cotton fabric. 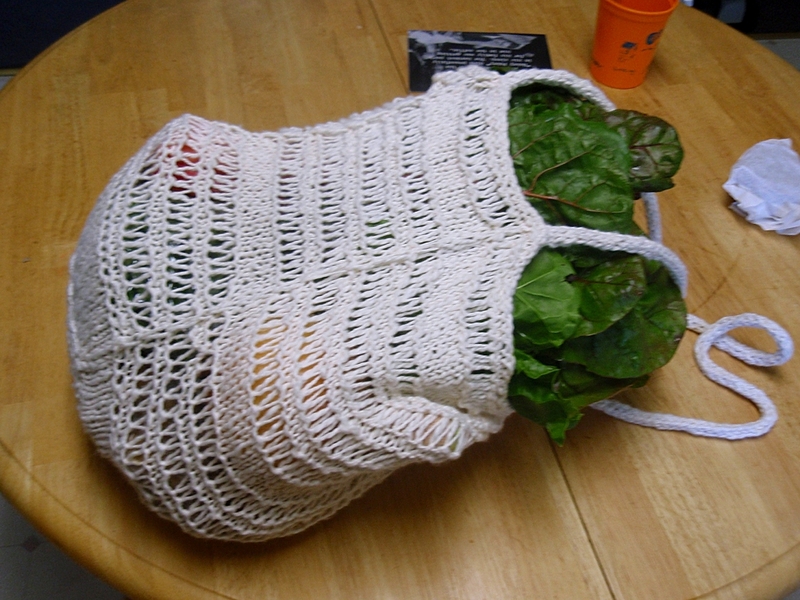 This will make it even warmer and will help keep the ends from unweaving as the blanket gets washed repeatedly. I think this project is great for both beginners or advanced knitters. The stitch pattern was easy to memorize and the neat design is a great payoff for a new knitter, while the bulky-weight guage offers fast satisfaction to a seasoned knitter who’s burned out on a shawl or more complicated patterns. The only adjustments I made to the pattern had to do with how much yarn I had. The pattern calls for 20 rows of each color (10 garter ridges), but I wasn’t sure I had enough yarn when I started, so I did 18 rows of each color. To make up for the lost length I added the white cotton stripe in the middle, and my afghan is just four rows longer than it would be if I’d followed the pattern. I will definitely make this afghan again the future, though I’ll have to find some new yarn. I love the organic cotton feel, but Knit Picks Comfy Worsted (cotton/acrylic) or even the pricey Blue Sky Alpacas Worsted Cotton would be great choices. I did estimate incorrectly on the amount of yarn I had, so I have leftovers of each color. I think I’ll make a matching bonnet! Cusp by Cookie A features a lace detail that swoops down and around the foot. My aunt received her Easter socks in the mail today, so I can finally post photos! 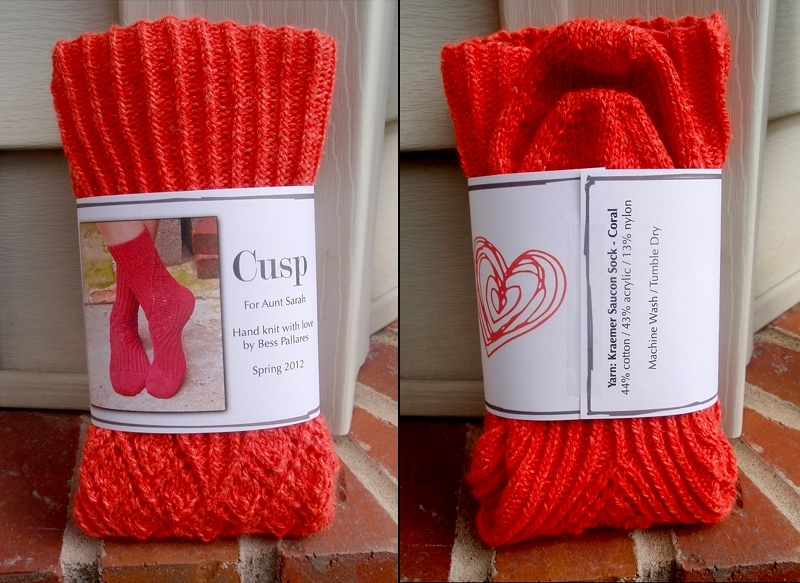 I present Cusp by designer Cookie A from her book Knit. Sock. Love. You can display a lot of information on a sock label, including washing/drying instructions. I knew that my aunt would love her socks any way I sent them, but doesn’t the label just add that something special? I’ve used a label once before – for my mom’s Christmas socks – and I’ve received a lot of comments and questions about them. I originally got the idea for a sock label from the Knitmore Girls blog (which I’m not linking to because I don’t care for it). I thought the idea was good, but the label example on their site was a bit bland, so I decided to spice things up with my own take on it. I think it’s important to convey something about the socks or the occasion with your label, and include special images or information, as well as anything helpful for the recipient, like the name of the sock and how to care for them. The only thing you need to design your own sock label is a word-processing program like Microsoft Word or Apple Pages (which I use). You can use your own images or find pictures and art online. Print your labels on cardstock paper to give them a professional feel and maintain their structure. I use a large paper cutter to trim mine down to size, but if you have a steady hand you can use scissors. To create your own sock label based on my examples, you can download the template here.This is a Microsoft Word (.doc) file, which you should be able to open in a number of computer programs. Play around with the design, line styles, images and layout of the label. This template is only meant to serve as a guide for people who have asked how I create mine. I hope you have fun creating your own sock labels! 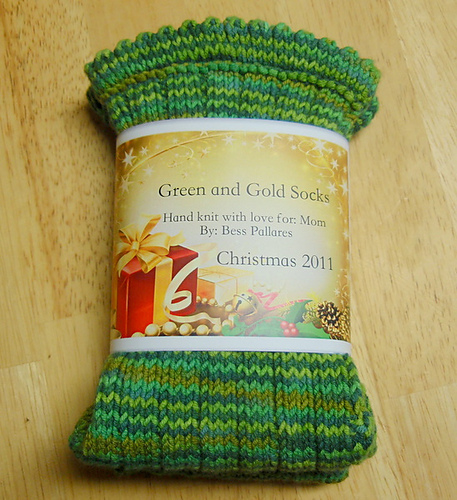 Knitters are creative people, and this simple project is a great way to add character to gift socks. 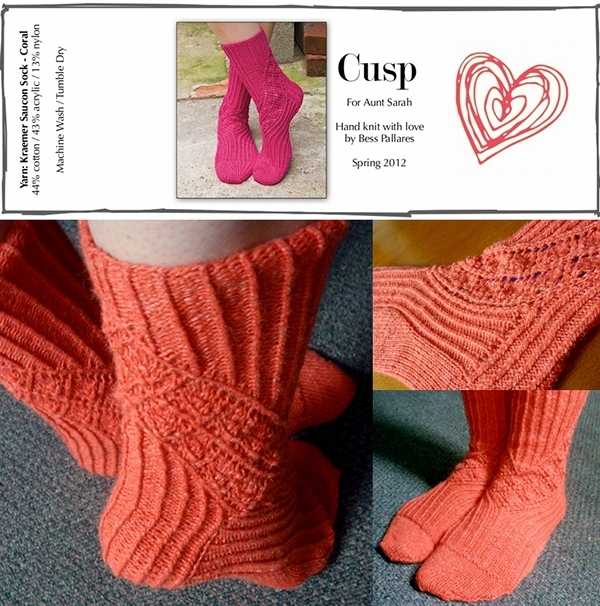 Pattern: Cusp by Cookie A, Knit. Sock. Love.